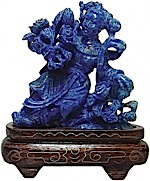 Item #GS-254: 2"x3" tall Lapis Lazuli Beauty carrying a basket of flowers and Child. Mounted on .75" tall carved wood stand. Item #GS-275: 3.25"x5.75" tall dark Blue with Gray Pyrite Beauty holding a Bouquet. Mounted on 1" tall carved wood stand. 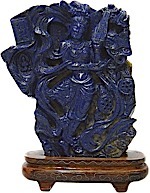 Item #GS-252: 2.75"x2.75" tall dark Blue Lapis Lazuli Beauty, Child and Basket of Chrysanthemums. Gray and Pyrite inclusions. Mounted on .875" tall carved wood stand. Item #GS-257: 4.5"x5.25" tall dark Blue Lapis Lazuli Beauty holding tray of food and Child holding a peach. Gray mottling and Pyrite inclusions. Mounted on 1.25" tall carved wood stand. 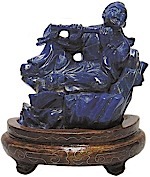 Item #20: 2.5"x2" tall dark Blue Lapis Lazuli with slight Gray mottling and Pyrite inclusions Buddha seated holding fruit. 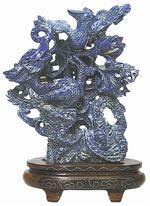 Item #1608-475: 5"x4" tall dark Blue Lapis Lazuli carving of Deer, Dragon, Bats and Fruit. Gray mottling and Pyrite inclusions. Mounted on 1" tall carved wood stand. 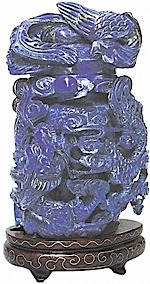 Item #GS-979: 2.3"x1"x1.25" tall, Lapis Lazuli Dog. Mounted on a 2"x3"x.5" tall wood stand. 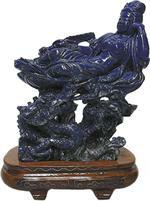 Item #1611-13: 6"x6.25" tall Lapis Lazuli Fighting Dragons ; Mounted on 1.5" tall wood base. 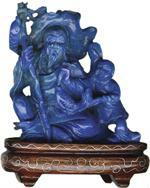 Item #GS-625: 2.5"x2.5" tall dark Blue Lapis Lazuli Fisherman with fishing pole, fish and boy. Pyrite inclusions. Mounted on .875" carved wood stand. 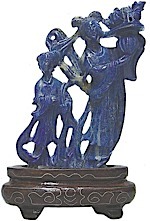 Item #GS-272: 4.5"x5.5" tall dark Blue Lapis Lazuli Flower Lady with Musical Insturment. Gray mottling and Pyrite inclusions. Mounted on 1" tall wood stand. 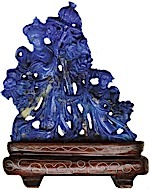 Item #1611-9: 4.5"x5.25" tall dark Blue Lapis Lazuli Flying Dragon and Bird. Gray mottling and Pyrite inclusions. Mounted on 1.25" tall wood stand. 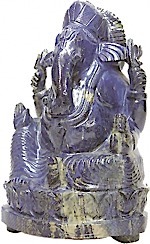 Item #GS-273: 4.75"x7.5" tall dark Blue Lapis Lazuli Ganesha with Gray mottling and Pyrite inclusions; 3,131.00 grams. 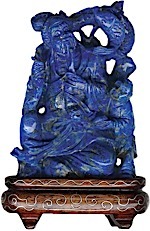 Item #GS-277: 2.5"x2.5" tall dark Blue Lapis Lazuli Lady with Roses. White mottling and Pyrite inclusions. Mounted on 1" tall carved wood stand. 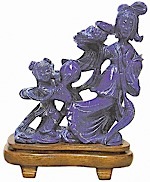 Item #GS-281: 2"x3" tall dark Blue Lapis Lazuli Fisherman, Boy and Fish. Gray mottling and Pyrite inclusions. Mounted on .875" tall carved wood stand. 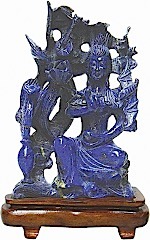 Item #GS-280: 3"x2.75" tall dark Blue Lapis Lazuli Musician. Gray mottling and Pyrite inclusions. Mounted on 1.25" tall carved wood stand. 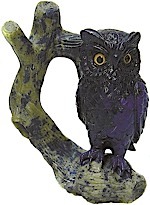 Item #GS-670: 3.5"x2.5" tall Royal Blue Lapis Lazuli Owl on a Gray Calcite branch. 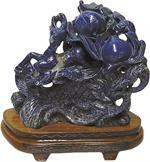 Item #1611-10: 4.75"x5.5" tall dark Blue Lapis Lazuli Reclining Beauty on a Dragon. Gray mottling and Pyrite inclusions. Mounted on .25" tall wood stand. Item #GS-2207: 1.75"x2.75"x.75" tall Lapis Lazuli turtle. Item #GS-2209: 1.5"x2.25"x.75" tall Lapis Lazuli turtle. 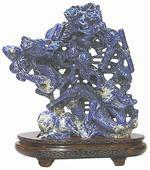 Item #GS-671: 2"x2.75"x.75" tall Lapis Lazuli turtle.